Contact FTS for more information on the propane commercial bus. As more bus fleets look for ways to lower emissions and comply with government regulations, many are turning to propane autogas as a proven, clean alternative fuel. Not only are propane autogas buses better for the environment than traditional fuels, such as gasoline and diesel, but they are also better on a bus fleet’s budget and provide the convenience fleet managers are accustomed to with traditional fuels. 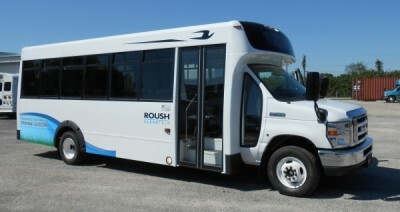 With an engine that thrives in the winter, a customizable refueling strategy and minimal, if any, updates to garaging facilities, propane autogas buses provide fleet owners with a smooth transition to an alternative fuel while offering the lowest total cost-of-ownership over the lifetime of the vehicle. Bus fleets making the switch all over the country are discovering these three, of many, reasons why propane autogas is the right fuel for them. Propane autogas buses love cold weather and have no issues with the elements, making the fuel more affordable to operate. In cold temperatures, diesel buses can be rendered inoperable, requiring owners to tether their vehicles to engine block heaters for hours with no assurance the vehicle will crank when needed. In most regions, diesel buses require fuel conditioners to address fuel gelling issues, creating an additional maintenance cost. If these conditioners are not used, the buses can break down and need to be taken out of service. Propane autogas engines provide reliable performance, regardless of the temperature, and they don’t require added fluids or engine block heaters, saving bus fleets from additional costs every winter. Because propane autogas vehicles start up immediately, bus fleets also do not need to worry about scheduling overtime for drivers and maintenance professionals to start up buses before they’re needed, as is the case with diesel. Not to mention, heat is supplied to cabs much faster than in a diesel vehicle. This allows drivers to focus on the road and gives passengers a safe and warm ride to their destination. This can contribute to increased driver retention and greater overall job satisfaction. In interviews conducted by the Propane Education & Research Council, bus drivers report the vehicles are cleaner, quieter, and easier to operate than diesel buses. On-site refueling solutions are recommended for fleets both small and large that require a centralized refueling station. Site preparation is minimal and similar to what many fleets already have in place, including a level area for vehicle refueling, crash protection, and an electrical supply for the pump and dispensers. Bus fleets have the option to own fuel tanks and dispensers or lease them from a propane supplier. Both options allow for infrastructure to easily expand with the growth of the fleet. A fuel storage tank, pump, and dispenser mounted on a trailer provides a convenient temporary refueling solution for bus fleets in the process of installing permanent infrastructure. Replenishing the fuel storage tank is scheduled with the propane supplier. For bus fleets that do not have plans to install infrastructure, mobile refueling is a viable solution. In this scenario, the bus fleet’s propane supplier works with the customer to create a customized plan for refueling the vehicles on-site with a bobtail delivery truck. In many cases, bus fleet managers can secure an annual or long-term fuel contract with their propane autogas supplier, locking in the price of the fuel regardless of fluctuations. Propane suppliers and infrastructure providers will work with you to determine the best refueling strategy for your bus fleet. In most cases, existing maintenance and garaging facilities will not require costly infrastructure changes during a transition to propane autogas. This is a stark contrast to many other alternative fuels like CNG and EVs. If existing buildings are code compliant for diesel and gasoline, typically there are often no infrastructure changes required for propane autogas. Ventilation requirements for propane autogas are the same as those for gasoline and diesel, and there are no specific modifications necessary to meet gas detection, sources of ignition, and electrical requirements. Segregation of major and minor repairs is not required either. Bus facility managers should always check with their local authority having jurisdiction (AHJ), though, which may have different codes than those set by the National Fire Protection Association, International Building Code, and National Electric Code. Incorporating propane autogas into a fleet doesn’t take a lot of work, from the garaging requirements to affordable refueling infrastructure. Once it’s up and running, bus fleet owners quickly see why propane autogas boasts the lowest total cost-of-ownership among any fleet vehicle fuel available. These benefits are all major reasons why so many bus fleets are making the transition to propane autogas.